The climate of this area is strongly influenced by its positioning between the Fraser Lowlands and the rugged Skagit Range mountains as well as its elevation. The weather of this drainage lies between that of the coast with its warm wet winters and that of the interior with its cold, snowy winters. Thus, significantly more snow falls and accumulates within the cooler E portion of the drainage. Some portions of the W valley bottom such as near Cultus Lake can be snow free most of the year. Within the valley bottom, summers tend to be warm throughout. Higher elevations, in general, are subject to short, cool and wet summers and long, cold winters with plenty of snowfall. Winds tend to be gentle from the W, although occasionally strong winds occur. 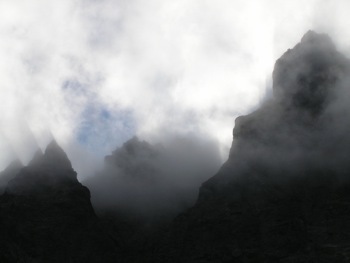 In the summer the higher elevations can often have low cloud or mist – sometimes these clouds form right before your eyes. The weather can change very quickly here from good to bad and vice versa. Rain storms are common and can occur at any time of the year. Rain can be relatively light or heavy and persist for extended periods. Always be prepared for rain when visiting this area. Weather forecasting: the forecast given by Environment Canada is meant for the City of Chilliwack and not necessarily for the valley. Often the forecast will predict better weather than the valley or upper elevation areas receive. Archived Hydrometric Data, Water Survery of Canada website for general information re: Chilliwack River flows. www.ec.gc.ca (Data Products & Services > Hydrometric Data).